Being nice is hard in a world that thrives on cut-throat competition. Some people are born with hearts as gentle as the winter sun. They cannot help but do everything they can to help people around them. But as the rules of the world go, they are not rewarded with the same treatment. 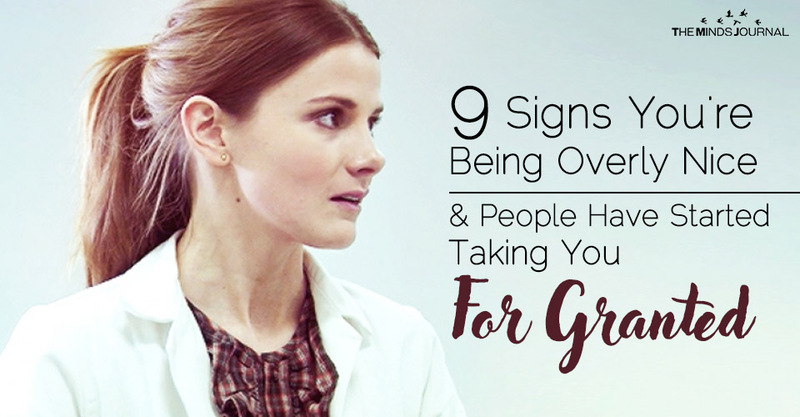 Most of the times, they are thrown around, taken for granted, and used as a doormat. The worst part is that their clouded judgment does not allow them to recognize this potential harm. They continue to give, and their friends continue to take them for granted. If somebody walked up to you and asked for your kidney, you would probably hesitate. But if they made a sad-face, you would wrench out your organ and hand it to them before their tears have a chance to roll down. You will go out of your way to do what is asked of you, even if it does not benefit you at all. This is very harmful because people get used to you saying ‘yes’ all the time, and they begin to forget that you have feelings too. Putting others first is a virtue. However, it is not one that is super practical today. If you continue this philosophy, then people will cut into your line, walk ahead of you, and will not even turn around to say ‘thank you’. The world does not work like that anymore. Put yourself first. Love yourself. Give your own self the pampering that you shower upon undeserving others. You will live a much happier life. You hide your true feelings, lest it should offend anybody. If the most annoying bully in the class comes up to you and asked, “Am I a bad person?”, then you will probably give them the pep-talk about how they are a special beautiful snowflake. You do not have it in you to put others down. But sometimes, you have got to push yourself into asserting your own opinion. If you don’t, then people will soon forget that you exist. You exist in your own right, so make it felt. If you ex-comes crying to you, then you generally take them back. You do not know how to build and maintain walls. It is important to mark your domain and to have a steadfast personality. People believe that they can ask anything off of you, and you will grant them that. Sometimes, if somebody gets too nosey or personal, you can’t even ask them to back-off for the fear of sounding rude. Learn not to let people get to close to you. They will completely destroy your own sanity. There are times when you have said ‘sorry’ for somebody else’s illness, or maybe a natural calamity. You continuously apologize for things that are not even your fault. If you do this, then people will find it very easy to make you the scapegoat. In the professional sphere, your colleagues will constantly put the blame on you, and you will continue to land up in pay-cuts instead of a raise. Don’t let yourself be run-over in this way. It is unhealthy and super insulting. Apologize only when you know that it is your fault. Otherwise, it will just make you an easy target.